There was a fair amount of coverage on space blogs earlier t his month about Felix Baumgartner’s Red Bull Stratos skydiving adventure, in which he set a new world record by jumping from 128,100 feet (nearly 24 miles). And why not? He ascended in a pressurized vessel that looked kind of like a space capsule wearing something very similar to a spacesuit to an altitude well above a good portion of the atmosphere. Space enthusiasts made the quick leap of imagination to a whole new sport of space diving, with daredevils jumping to Earth from suborbital space and, ultimately, orbit. Well, just fahgedaboutit! Baumgartner says that’s a terrible idea. And he has some choice words for Richard Branson and Mars exploration. 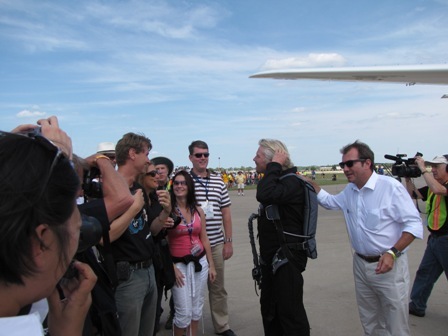 Will Whitehorn gives a pat on the back to Richard Branson as he greets Virgin Galactic ticketholders during the Oshkosh air show in 2009. He says it will be at least another 12 or 18 months before the Virgin Galactic venture can offer paid space travel to adventurers…. Record breaking and history making jump from the edge of space by Felix Baumgartner. View from helmet cam. Music by Ewan Dobson – Space Walk. BALTIMORE, MD, Oct 9, 2012 (Juxtopia/Sol-X PR) — Inside Baltimore’s JUICE Lab, Solar System Express (Sol-X) and Juxtopia LLC are collaborating to transition sci-fi gadgets as seen in Star Trek (2009) and Iron Man (2008) into reality. Technology transfer between the companies will result in a high-tech system to control the fall of skydivers from altitudes above 120,000 feet, near the edge of space, and provide a visual Augmented Reality display during the journey. Product code name – RL Mark VI. Felix Baumgartner will attempt to set a new skydiving record on Tuesday morning by jumping from 120,000 feet. If successful, he will break the record of 102,800 feet set by U.S. Air Force Colonel Joseph Kittinger in 1960. 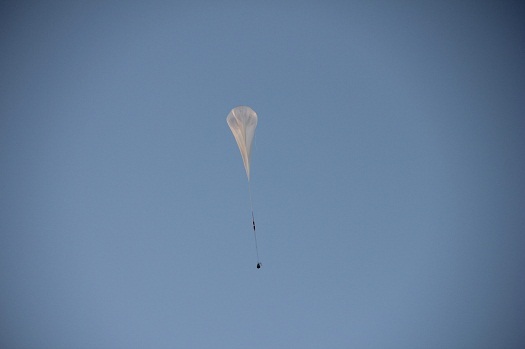 The Red Bull Stratos mission is set to begin at 8:30 a.m. EDT (5:30 a.m. PDT) from Roswell, N.M. if weather permits. Baumgartner will ascend in a pressurized capsule attached to a balloon. Watch Live: The Mission will broadcast on www.redbullstratos.com, www.youtube.com/redbull, and www.redbull.tv (App also available on iOS & Android). 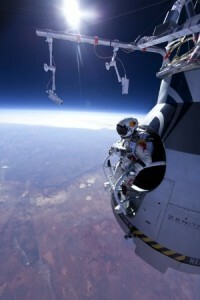 For more information, visit www.redbullstratos.com. ROSWELL, N.M. (Red Bull Stratos PR) — The final countdown for Felix Baumgartner’s history making jump from the edge of space began on Monday after the Red Bull Stratos Technical Project Director Art Thompson declared the repaired space capsule is fit and all systems are go. The tentative launch date for Baumgartner’s attempt to jump from an altitude of 36,576 meters has now been set for October 8, ending a period of uncertainty for the team and, for Baumgartner, the agony of waiting. The Austrian extreme sport athlete had to endure delays due to the repairs but is now delighted that the countdown is on for his attempt to become the first person to break the sound barrier in freefall and set four other world records in the process. Video Caption: Felix Baumgartner completed a second test dive from a balloon hoisted capsule. 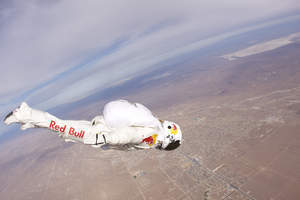 He reached 536 mph in the freefall. His objective is to break the speed of sound on his next dive from 120,000 feet. Felix Baumgartner landed safely yesterday after jumping from 96,640ft (29,455m) at a top speed of 536mph (863kph) over Roswell, N.M. This was Baumgartner’s second test dive before he tries to set a new dive record this Fall under the Red Bull Stratos project. Video Caption: On March 15, 2012, Austria’s Felix Baumgartner jumped out of a space capsule from an altitude of approximately 71,580 feet as the Red Bull Stratos project moved forward into the manned flight stage in New Mexico. The 42-year-old rode the space capsule attached to a giant helium balloon above the so-called “Armstrong Line.” The goal of the Red Bull Stratos project is to see Baumgartner attempt a record-breaking freefall from 120,000 feet this summer where he’ll potentially become the first man to go supersonic without the support of a vehicle. ROSWELL, NM (Red Bull Stratos PR) – At precisely 9:50 a.m., Felix Baumgartner landed with his parachute in the New Mexico desert nearly 30 miles away from Roswell, wearing a spacesuit as he safely completed a journey towards the edge of space. Just 1 hour and 40 minutes earlier the extreme athlete from Austria had lifted off from Roswell on board a space capsule attached to a 165-foot-high helium balloon that brought him to an altitude of nearly 71,580 feet. Together with a team of aerospace experts, Austrian extreme athlete Felix Baumgartner is ready to rise to the challenge of the Mission Red Bull Stratos. His aim is to jump from a balloon in the stratosphere from an altitude of 36,57 meters (120,000 feet) and perform a record-breaking freefall. Baumgartner wants to become the first person to break the speed of sound without the protection of an aircraft while simultaneously collecting data never obtained before for the advancement of medical science. After testing in an elaborate altitude (vacuum) chamber in Texas, the mission has moved on to a decisive phase at Roswell, New Mexico. Felix Baumgartner’s quest to achieve a supersonic parachute jump has run into some legal turbulence. Energy drinks maker Red Bull, which is sponsoring the effort, said today that it is stopping the program “with immediate effect” pending the outcome of a “multimillion dollar lawsuit” filed earlier this year by a man claiming certain rights to the project. Working under the auspices of the Red Bull Stratos program, Baumgartner was aiming to be the first person ever to hit supersonic speeds in the atmosphere without the protection of an aircraft around him. The Austria-born daredevil, who has in excess of 2,000 parachute jumps to his credit–often from stunningly low altitudes–was to ascent to the rarefied height of 120,000 feet (23 miles) in a pressurized gondola below a balloon, and then jump. Falling from the edge of Space: Lights, Camera, Freefall! The Stratos mission team gives an exclusive look at the custom camera systems that will record and broadcast Felix Baumgartner’s stratospheric mission later this year. Bringing together high definition and real time images to a supersonic freefall in the hostile environment of 23 miles / 36 km above earth won’t be easy. The hardest part about riding a balloon up to 120,000 feet, jumping out and free-falling faster than sound before parachuting to Earth is likely to be sitting around in the pressure suit, Austrian pilot Felix Baumgartner said Wednesday. Later this year, Felix Baumgartner will parachute from an altitude of 120,000 feet in a mission called Red Bull Stratos. This will be the longest stratospheric free fall in history. Baumgartner is hoping to become the first human to break the speed of sound with his own body.